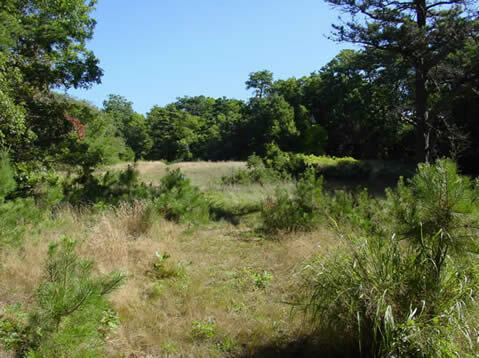 Acquired by the town in 2001 from Edward F. Roskovics, these 20 acres are part of North Falmouth’s rolling upland hills. Although the parcel is overgrown with brambles among the pines and oaks, there is some evidence of landscaping, and the introduced plants now thrive in the wild. Rabbit and fox burrows have been spotted in the parcel. Birding is excellent in the open areas. Volunteer steward Hilary Hunt received Conservation Commission approval in spring 2007 to clear a trail, and carved a beautiful loop which shows off the parcel's varied terrain and habitat. Beginning in the woods, the trail meanders up and down through the trees, but then opens up to what was once a dirt road that traverses a sunny meadow. The old road curves around a bend and climbs a small, grassy knoll—walkers can turn around to have a lovely view of the land below—before heading back into the woods and the start of the loop. The Roskovics parcel lies between Route 28 and Route 28A in North Falmouth. While housing subdivisions are clustered around the open space on three sides, these are virtually invisible from the trail. Access to the property is from Trickett Street, off North Falmouth Highway, about a mile north of the intersection with Thomas B. Landers Road. Heading up Trickett Street, the dirt road easement into the conservation land is immediately past the second house on the right. A small parking area with room for two or three cars is just ahead, next to the trail leading into the woods.